Something about the bolt clamping the two pieces of the front fuel tank strap together has bothered me no end. I'm pretty sure I didn't have it too tight, but the bolt alone always tended to bend the tabs together (deforming them). So, fire away for an unauthorized modification because I sized and installed a spacer for that bolt that enables the strap to snugly hold the tank at a good tension --- but stops it from deforming the tabs. I thought I might've missed it in the manuals but found no evidence of a spacer supposed to be there. I think maybe it's a M151 thing? Been a long time since I drove one, but the idea seemed familiar. Very little tension is required to keep the tank in place. 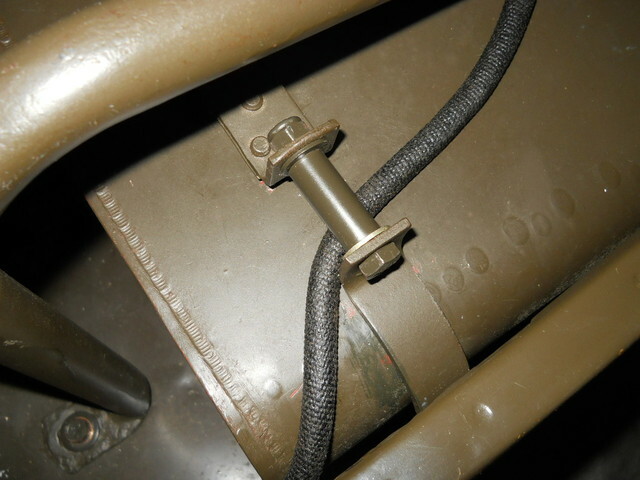 There are at least 5 illustrations in the many M38 manuals that show the tank installed and the few with good detail show no spacer and still show a slight tilting of the strap ears when the tank is secure. Obviously the slight tilting does no harm and Willys saw no need to prevent the slight tilting. Of course you are welcome to add parts and make things more presentable but if you are planning on relying on the holding power of that self locking nut you must have at least 1 1/2 threads showing past the fiber material. You need a longer bolt or remove a washer.